Galatasaray are indeed the historic number one club in Turkey, although Fenerbahçe and, to a lesser extent, Beşiktaş fans may have their objections. Looking at Galatasaray's numbers it's rather safe to claim that they are the biggest Turkish club. Having won more Championship and Cup titles than their Istanbul archrivals, and, very importantly, being the only Turkish club to have won a major UEFA competition. Galatasaray and Fenerbahçe players in a picture from the 1920s. Galatasaray Spor Kulübü (Sports Club; so it is formally incorrect to refer to this club as Galatasaray FC in English) were founded in 1905 by 19-year-old, back then, Galatasaray High School student Ali Sami Frashëri, who tempted some of his fellow students to form a team and start playing games against English and Greek teams that pre-existed in Istanbul. If the first two thirds of his name look familiar, it's because in 1934, after the enactment of a law on family names in Turkey, the Albanian-Turkish Frashëri switched to “Yen”, hence “Ali Sami Yen”, the legendary stadium Galatasaray called home from 1964 (thirteen years after Yen's death), until 2011. 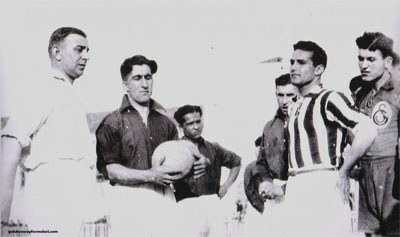 Galatasaray competed in Istanbul's local Championship for over half a century, and when Turkey started having a national competition in 1959, the team were in excellent position to spread their dominance nationwide. After finishing second in 1959 and 1961, Galatasaray won their first Championship title in 1962. Fast forward to our days, “Cimbom” (possibly their most common nickname, a word that doesn't really mean anything in Turkish, and is just a pair of syllables included in an old fan chant) can boast 20 Championship wins, more than any other Turkish club. In 1963 they won the Championship and the Cup, the first of their 17 in total, another number that makes Galatasaray the envy of the other two huge Istanbul clubs, Fenerbahçe and Beşiktaş. What makes Galatasaray though stick out the most among all Turkey's greats, is that in 2000 they beat Arsenal in the final of the UEFA Cup (today's Europa League), in Copenhagen, becoming the first (and only, until now) Turkish club to lift a major European trophy. A few months later, led by newly-signed Brazilian striker Mário Jardel, Galatasaray beat Real Madrid in Monaco, winning the UEFA Super Cup as well, earning themselves another nickname, “Avrupa Fatihi”, Turkish for “Conquerors of Europe”. Jardel had been signed to fill the void left by Hakan Şükür's departure, the second in five years. Şükür first wore Galatasaray's jersey at the age of 21, in 1992, and three years later, having a record of one goal in less than every second game, he moved to Italy, a rare, back then, move of Turkish player abroad, especially to Italy's top-class league. After failing to adopt at Torino, Şükür returned to Galatasaray for the best years of his career, until 2000, with the UEFA Cup win as the cherry on top of his glory days at Ali Sami Yen. 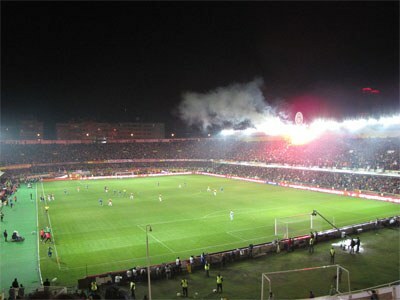 Galatasaray playing at Ali Sami Yen Stadium in March 2009. In 2003, Şükür returned to his beloved Galatasaray for a third (and final) stint, until he retired, aged 37, in 2008. Despite the fact that others have played more games with Galatasaray's jersey (Bülent Korkmaz, from 1985 to 2005), or scored more goals (Metin Oktay, in the fifties and sixties), Şükür can be considered their most iconic figure, being second in both lists (of matches played, and goals scored). 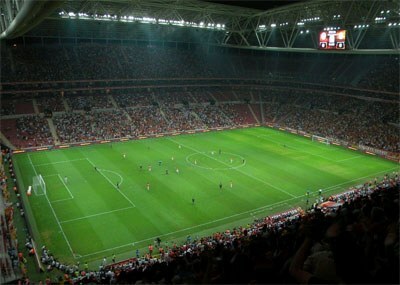 Titles and players-aside, a major event in Galatasaray's recent history was moving into their spectacular Türk Telekom Arena in 2011. Historic Ali Sami Yen stadium was sadly demolished, but everyone agreed that the time had come for a true European, and not just Turkish great, to have a correspondingly great modern stadium, able to host more than 50,000 fans. Galatasaray's Türk Telekom Arena in July 2011. Galatasaray's logo in their early years used to be the Arabic characters for “G” and “S”. Exactly the same idea was followed when the club updated their logo, using the Latin characters of the very same letters, plus, including 1905, their founding year. In 2015 Galatasaray won their 20th Championship title, and ever since then they have been boasting four stars above their emblem on the jerseys, with each star corresponding to five titles. 1909 The club winning their first league title (Istanbul League). 1946 The club move to the Ali Sami Yen Stadium. 1962 First time national league champions. 1963 First Turkish Cup title. 1963 Winning their first Double (the Süper Lig and the Turkish Cup). 1992 Hakan Şükür is transferred from Bursaspor. 1996 Gheorghe Hagi is transferred from Barcelona. 2000 Winning the UEFA Cup and their first major European cup title. 2000 Winning the UEFA Super Cup. 2011 The club move to the Türk Telekom Arena.